The British drive the Turks out of Kara Tepe and the Turks flood the country between the Nahrin and Diala Rivers. S S Dowlais (Master R Montgomery) is torpedoes and sunk by UB-48 off Cap de Fer while carrying copper ore. Her crew of twenty-six is lost including her Master. Major Harold Gwyer Garnett (South Wales Borderers) is killed in action at age 38. 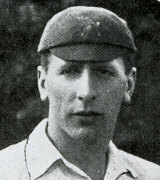 He was the son of Alexander Garnett, JP and appeared in 152 matches for the Lancashire Cricket Club and represented Argentina. Temporary Lieutenant Colonel Donald Knox Anderson MC (East Kent Regiment attached Machine Gun Corps) is killed at age 31. He is the son of George Knox Anderson JP MP who lost his younger son in August 1914. Major Edmund Fitzgerald Smyth MC (Irish Rifles) is killed at age 31. He is an Irish International Rugby player. Captain Oscar Henry MacReady (Royal Irish Rifles) is killed at age 21. He is the only son of the Reverend H H MacReady. Captain Julian Lawson Whalley (Essex Regiment) dies of wounds as a prisoner of war having been captured two days prior. The 33-year old is the son of Colonel J Lawson Whalley JP (Colonel Commandant of the King’s Own Royal Lancaster Regiment) and stepson of Lord Aston. Second Lieutenant G V Blake (Shropshire Light Infantry) is killed in action at age 30. He is the son of Henry Blake JP. Acting Lance Sergeant John Boon (Bedfordshire Regiment) is killed in action in Palestine. His brother will be killed in March 1918. Lance Corporal Stewart George Dewar (Ontago Infantry) is killed at age 32. His brother was killed less than 2 months ago. Private Emil Leonard Dow Aitken (Staffordshire Yeomanry) dies of wounds at age 24 in Palestine. His brother will die of wounds next September. Private Lawrence Curtis (Lancers) dies of wounds at age 30. He is the final of three brothers who lose their lives in the Great War. Private Edward Shearon (South Staffordshire Regiment) is killed at age 43. His brother was killed last September. Private Esau Baker (Newfoundland Regiment) is killed at age 30. His brother was killed 2 months earlier. Private Francis Harry Haywood (Warwickshire Regiment) is killed in action. He is the first of three brothers who will lose their lives in the Great War.